I’ve never had lunch in three restaurants on the same day before. But a ‘safari’ lunch was a great way to show journalists PayPal’s in-app services: order ahead, pay at your restaurant table and picture payment – all on your mobile phone. Here’s how it worked. We started at Prezzo in Glasshouse Street, London, for a starter. 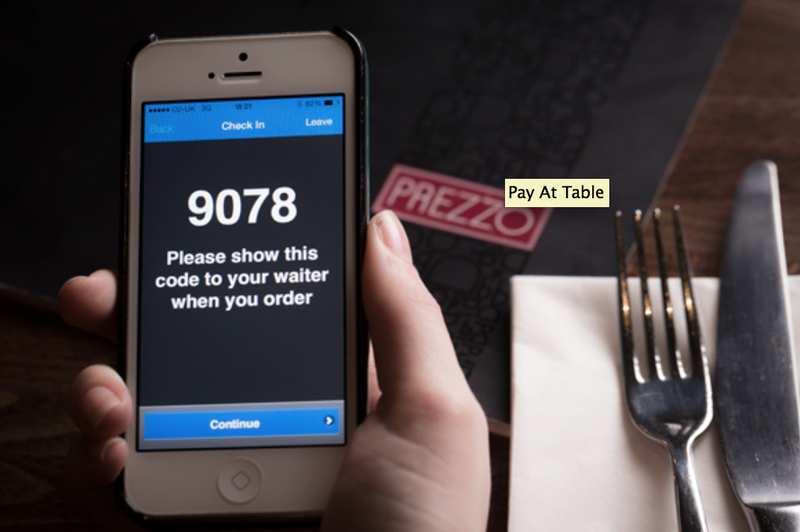 We ‘checked in’ to the restaurant through the PayPal app, giving the waitress a code (above). We split the bill between us – all from within the PayPal app. I had the bruschetta, which was delicious. No waiting for a paper bill or for the waitress to bring a card machine. The pizzas looked tempting, but it was time to move on. A brisk walk through Soho took us to Gourmet Burger Kitchen (GBK) in Frith Street. Once again, we checked in through PayPal’s app, this time paying with our profile pictures, which appeared on GBK’s till. Being a creature of habit, I chose GBK’s Smokin’ Joe burger, with coleslaw and salad instead of a bun. It was now time to show the journalists how easy it is to choose and order a takeaway on your phone. 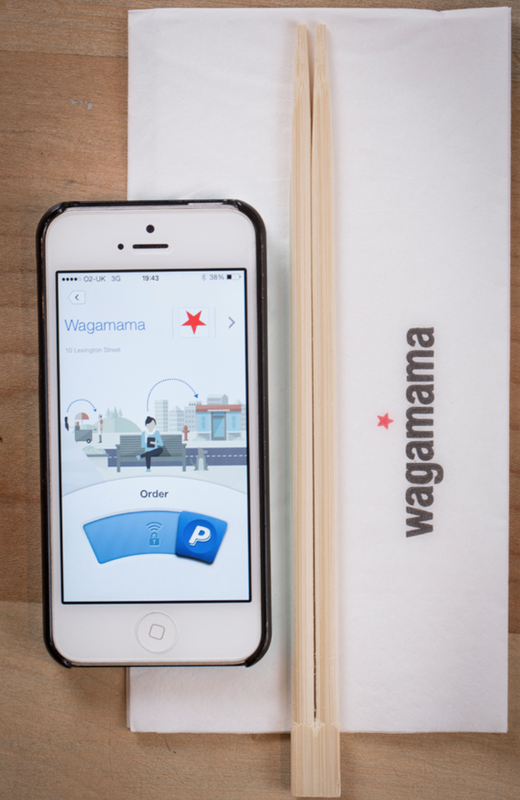 As we were finishing our GBK burgers, we opened the PayPal app again to check in to wagamama‘s Lexington Street, Soho restaurant (above). The wagamama take out menu appeared and we ordered for collection 15 minutes later. It was obvious who was still hungry – I went for peppermint tea, but others went for teriyaki, ramen and cheese cake! Next time, I’ll go for a bento box. Everyone went away with an insight into how the mobile phone can make save us time when we use it to order and pay. At PayPal, we’re intrigued by the possibilities. And when I accidentally left my wallet at home today, I didn’t go hungry: I paid with PayPal at the excellent Cook & Garcia cafe in Richmond. You can download the PayPal app here. Disclosure: I am PR director for PayPal UK and Ireland. Mobile World Congress is quite a show. Over 70,000 people descend on Barcelona for the annual mobile industry expo. It’s not just about handsets: it’s about everything related to connected commerce, from phones and tablets to payments and even connected cars. 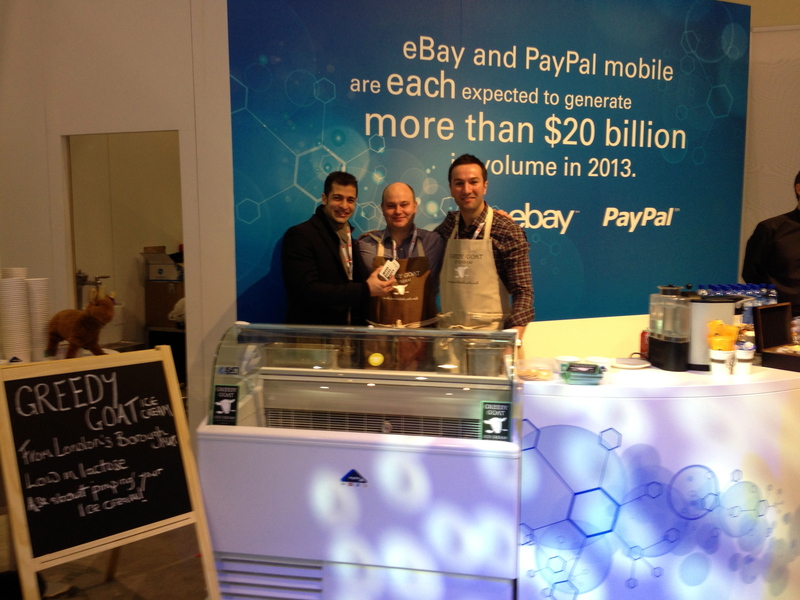 For me, MWC 2013 was memorable for the huge interest in the UK version of PayPal Here, PayPal’s flexible and affordable way for small businesses to take credit card payments face to face. The PayPal Here demos were mobbed by everyone intrigued by the way PayPal had reinvented the original Here concept for countries like Britain where paying by Chip & PIN is standard. The UK version is a pocket-sized card reader that connects to a trader’s smartphone via Bluetooth. The fun bit was having Mark and Craig from London’s Greedy Goat ice cream on the stand, serving their delicious goat’s milk ice cream. (I recommend the honeycomb flavour…) Greedy Goat is one of the businesses that have been helping PayPal design the UK flavour of PayPal Here. It trades at Borough Market, and it will be one of the first businesses to take card payments through PayPal Here in the next month or so. Here’s the video showing Greedy Goat trying PayPal Here at Borough Market. But there’s more to PayPal Here than just card payments. The future probably lies with something rather more 21st century than a card. 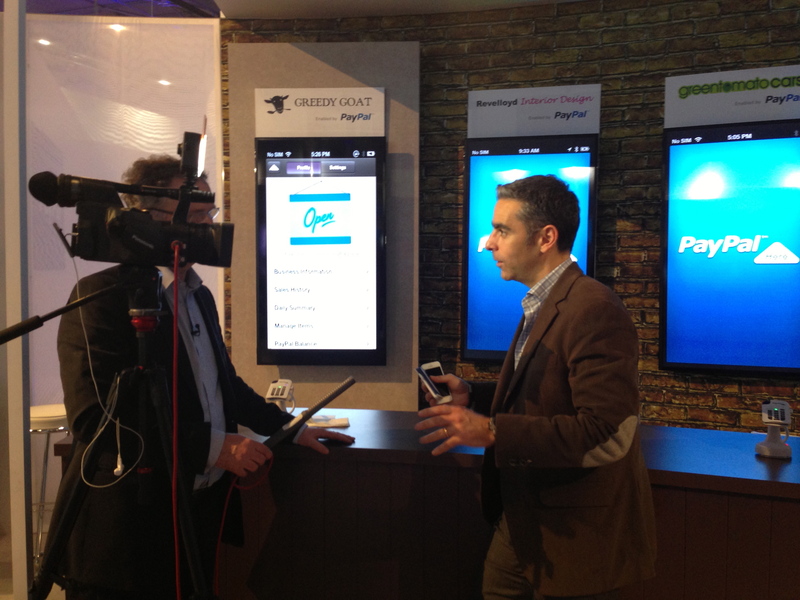 PayPal is pioneering payment via ‘check-in’: a quick tap in an app to check into and pay a local business. 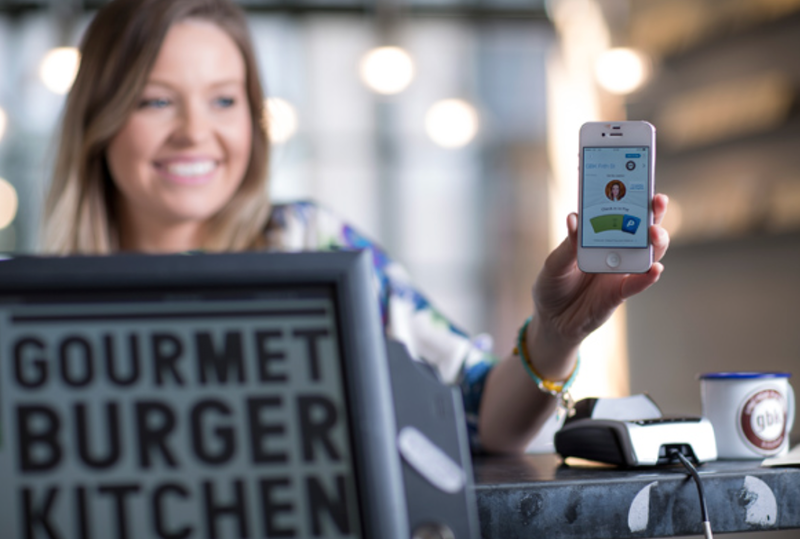 This opens up so many possibilities for making life quicker and easier: for example, ordering your drink or lunch ready for collection, beating the queue. PayPal is pioneering ordering ahead with Jamba Juice in the United States. Anyone interested in finding out more about PayPal Here can register their interest and get all the facts at www.paypal.co.uk/here. 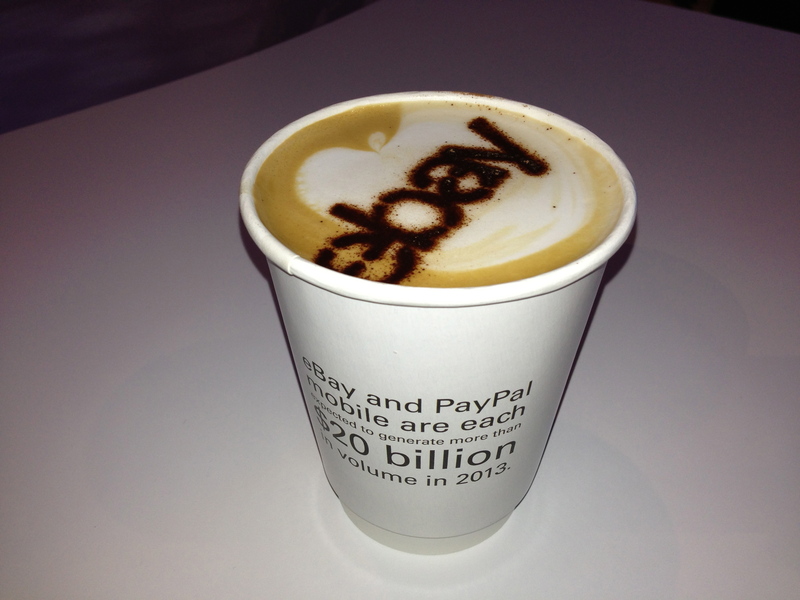 PS: we served the best coffee at MWC. 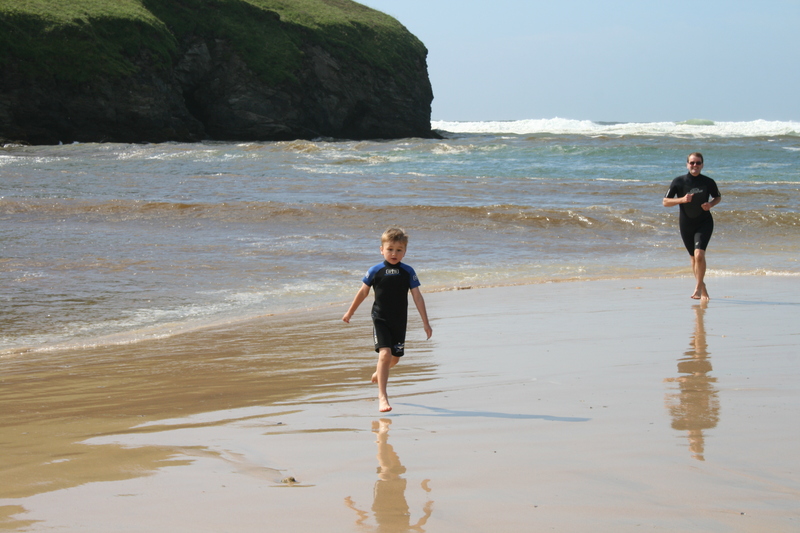 We’re packing up to go home after a wonderful week’s holiday at Mawgan Porth, on Cornwall’s Atlantic coast. This is a very special place in a very special Celtic part of Britain. Karen and I both have special childhood memories of Cornwall. Prompted by those memories, we brought Owen to Looe for his very first holiday, when he was nine weeks old. 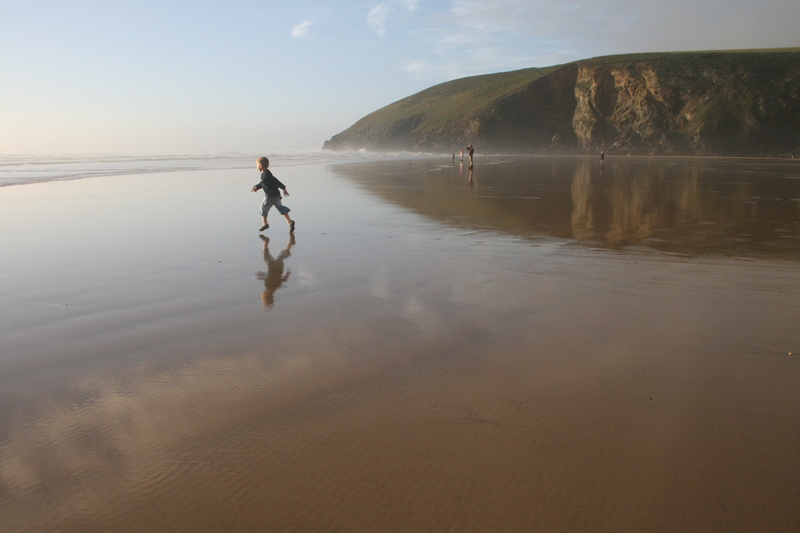 We first stayed at Mawgan Porth in 2011, and loved the place and the experience. We were very lucky with the weather last year, spending most days in the pool and on the beach. We saw more rain this year, but we still enjoyed time on the beach as the rain cleared and the sun came out. This is the classic family holiday spot. Small children enjoy the same kind of seaside summer fun as as their parents and grandparents. Timeless pleasures – splashing in the sea and rock pools; building sandcastles; relishing an ice cream as the day draws to a close. You can’t catch me Dad! We stayed at The Park, a lovely holiday village just 10 minutes’ walk from the beach. We discovered The Park when staying at its sister site in Dorset, Greenwood Grange. The owners took over a few years ago and have made huge improvements. We love the cafe-restaurant, with its great value homemade food (do try the halloumi cheese, haddock and lamb burgers if you get the chance). There’s also a wonderful indoor pool next to the cafe – we had it to ourselves on Friday morning – as well as a heated outdoor pool. Our only serious criticisms? The sofa in our cottage has seen better days, and the cafe-restaurant was closed for a whole day for a wedding, which hardly seemed fair to everyone who had spent good money booking a week’s holiday. Judging from our experience over the last 12 years, Cornwall has become a place to enjoy wonderful food and drink as well as seaside fun. Back in 2001, we discovered magnificent food at Barclay House in Looe under Nick and Kelli Barclay, who now run the Blue Plate Restaurant in Downderry near Looe. This week, we had a great lunch at Fire at Mawgan Porth and a delicious lunch at the Falcon Inn at St Mawgan, as well as our meals at The Park. We hope to return to Cornwall in 2013.